The worst things are always unseen: the bloodshed just off-stage or -screen, the implied atrocity, the imagined worst case scenarios. The same goes for Eclipsed, a violent play in which violence is more a texture than a series of acts. Set in a warlord’s compound during the Liberian civil war in 2003 and focusing on the women scratching out a living there, Danai Gurira’s play and Caroline Byrne’s production keep all of the worst horrors out of sight, but their shadow is ceaselessly cast over everything else. So we see guns, but we never witness anyone being shot; we see the aftershocks of battle, but never the moment of impact. The daily reality of sexual violence, meanwhile, is gestured towards with little more than the clanging of a door and the sudden, obedient formation of the commanding officer’s “wives” into a line: a ritual as regular as clockwork, broken when one is selected and silently offers her body in exchange for her safety. The microcosm that Eclipsed depicts is a man’s world populated by women, with the forces controlling their lives always just around the corner, their presence oppressive but invisible. This raises a knotty and regularly asked question: does the representation of violence (and especially violence against women) simply reinforce the structures and ideologies that allow that violence in the first place? And is a representation of violence on stage indeed an act of violence in itself? Here, violence has become habitual in the lives of these women, but its destructiveness is never normalised. When a nameless new arrival turns to guns rather than her body as a tool of survival, we feel the full, horrific weight of that (non-)choice, as well as the power structures that force it upon her. Violence also turns things upside down, unsettling reality. Beneath the routine brutality, there’s a strange tedium to conflict in the experience of these women. Eclipsed brilliantly captures the precarious yet mundane rhythms of their existence, in which war has become a constant, faded backdrop. It’s not the atrocities that demand stage time so much as the long expanses in between, dead hours to be filled with joking and squabbling and reading eagerly from a battered Bill Clinton biography (the States always distant yet near). Humour is punctuated with horror. Much like Palestinian drama Fireworks (another of the best new plays I’ve seen so far this year), life in Eclipsed has a flat yet brittle texture, one that threatens to be shattered by the yearned-for but terrifying promise of peace. It’s become impossible to imagine a time beyond the conflict – as one character puts it, “I don’t know who I is out of war”. When your identity is so wrapped up in violence and instability, how do you get a hold on who you are? 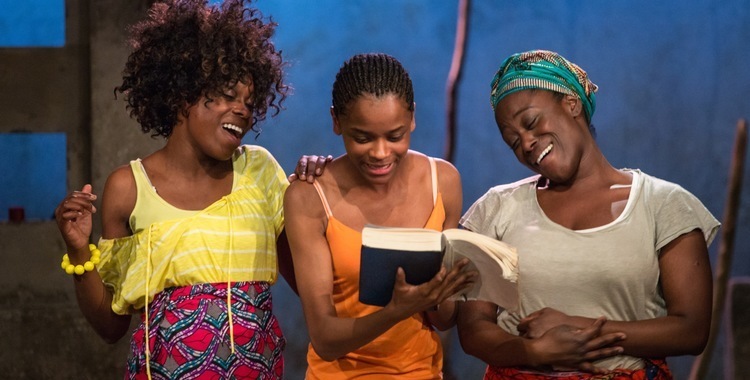 For all of its vital wider critiques, it’s the five complex female characters who emerge most powerfully from both Gurira’s play and Byrne’s assured, compassionate production. They’re all known by role rather than name: the commanding officer’s wives numbered by rank, the visiting outsider simply identified as one of Liberia’s Women of Peace. Yet in the hands of Byrne and her brilliant cast, each is distinctly and humanely individual. Wives number one and three (Michelle Asante and Joan Iyiola respectively) bury fear and anxiety in affectionate quarrelling, jostling for the CO’s favour. The former discovers a glimpse of herself when she scores her real name – Helena – into the scorched earth; the latter finds meaning in the birth of her daughter. Lingering on the edges of the compound are Faith Alabi’s diamond-hard wife number two, now going by the name of Disgruntled and toting a gun, and Rita (T’Nia Miller), a woman on a mission for both peace and her missing daughter. But it’s the astonishing Letitia Wright as the new girl – we never learn her name – who leaves the most shattering impact. Tough yet vulnerable, there’s a determined stillness to her suffering, everything contained behind the eyes. When that exterior finally cracks, the shockwaves reverberate long after the curtain call. We don’t need to see what has happened to her to feel the depth of its horror.